I want to extend a warm welcome to all pupils and parents for the new school year and to welcome Elise Sutherland and Kelly McNally as new staff members to the school. Since the last update, there have been some new developments, some of which you will already know about but it is still useful to recap. We held our AGM in June. Although it is traditionally held at the same time as the Open Evening, we generally still get a very low turnout. I want to thank those parents who took the time to drop by to listen to the Head Teacher’s presentation about Curriculum for Excellence. The AGM provides an opportunity to hear what we have done in the past year as well as elect new members and get a flavour of what the aims for the coming year will be. Sarah and Gary are the newest members of the team and I welcome them. For new parents to the school, I want to point you to the Parent Pages on the Blog, which contains useful articles and our Action Plan. 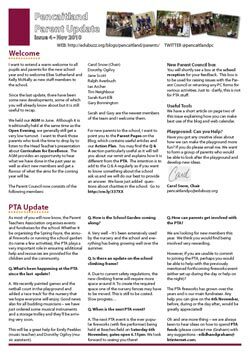 You may find the Q & A section particularly useful as it will tell you about our remit and explains how it is different from the PTA. The intention is to add to the Q & A regularly so if you want to know something about the school ask us and we will do our best to provide an answer. We have just added questions about charities in the school. Go to http://ow.ly/337XX. You will shortly see a box at the school reception for your feedback. This box is to be used for raising issues with the Parent Council or returning any PC forms for various activities. Just to clarify, this is not for PTA stuff. Have you got any creative ideas about how we can make the playground more fun? If you do please email me. We want to form a group of parents who would be able to look after the playground and develop new ideas. As most of you will now know, the Parent Teachers Association organises events and fundraises for the school. Whether it be organising the Spring Fayre, the annual Fireworks or running the school garden (to name a few activities), the PTA plays a very important role in ensuring additional help and resources are provided for the children and the community. Q. What’s been happening at the PTA since the last update? A. We recently painted games and the netball court in the playground and added a ‘race track’ for the nursery that we hope everyone will enjoy. Good news also for all budding musicians – we have just ordered some musical instruments and a storage trolley and they’ll be arriving very soon. This will be a great help for Emily Peebles (music teacher) and Dorothy Ogilvy (music assistant). Q. How is the School Garden coming along? A. Very well – It’s been extensively used by the nursery and the school and everything has being growing well over the summer. Q. Is there an update on the school climbing frame? Q. When is the next PTA event? A. The next PTA event is the ever popular fireworks (with fire performer) being held at Beeches field on Saturday 6th November, gates open 6.15pm. We look forward to seeing you there! Q. How can parents get involved with the PTA? We are looking for new members this year. We think you would find being involved very rewarding. However, if you are unable to commit to joining the PTA, perhaps you would be able to help with the previously mentioned forthcoming fireworks event (either set up during the day or help on the night)? The PTA fireworks has grown over the years and is our main fundraiser. Any help you can give on the 6th November, before, during or the day after, would be greatly appreciated! 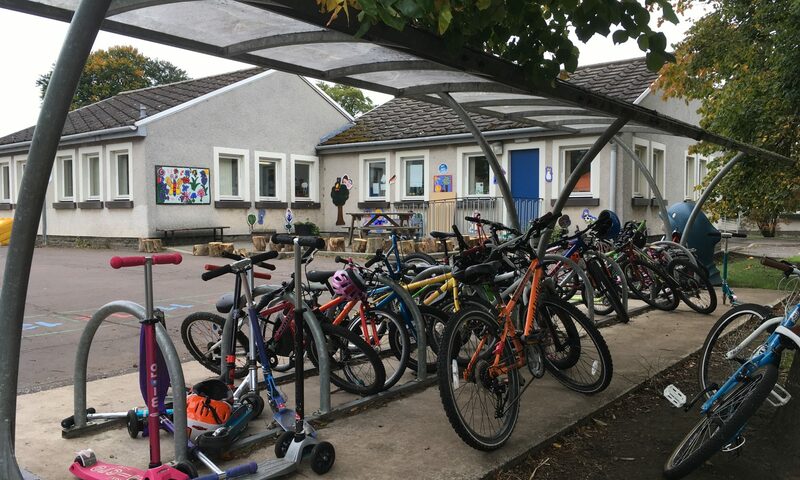 Oh and one more thing – we are always keen to hear ideas on how to spend PTA funds (please contact me (Graham) with any suggestions – eilidhandgraham@btinternet.com. This year the first main event for the Parent Council has been being involved with the recruitment and selection of a new Deputy Head Teacher. As most of you will be aware, Mags McBean, has become the Head Teacher at Macmerry Primary and we wish her much success. Interviews were held on 16 September and the Parent Council was involved in the interviews. We really had a difficult choice as we had such great candidates. We are delighted that Elise Sutherland has been the successful candidate. She will be here until the end of June 2011. She will be one of the several new faces you see around the school this term and we wish her well. I hope many of you will get the chance to meet her over the coming months. Just when everyone is getting to grips with the role of Parent Councils, we have another body we want to introduce to you – the National Parent Forum Scotland (NPFS). Each local authority area has a member of the NPFS. The NPFS gives Parent Councils an opportunity to discuss and raise issues of mutual interest or concern at a national level. Carol Snow, the Parent Council Chair, is the East Lothian Representative and attended the AGM on 4 September. This is an exciting time to be involved in the education of Scotland as Curriculum for Excellence is implemented. Objectives include – Developing resources to support parents/parent councils on school closures; Working with partners in developing Fact Files that are parent friendly; Developing a relationship with all Local Authority Education Services and to develop the organisational structure with clear lines of responsibility and participation by all in the Forum. HMIE has a consultation on inspections in schools. The document called ’Public consultation on proposals for the HMIE school inspection framework starting in Autumn 2011’ can be found at http://bit.ly/HMIEPC. You may also find this news release helpful in understanding more about the consultation. http://bit.ly/HMIEPC2.If anyone has any comments to make let us know by December 3rd. There is a communication toolkit which can help all of us understand CforE better which you can find at http://bit.ly/CfETOOLKIT. In addition there are fact files; one on background and benefits, one on assessment and qualifications, and one on the secondary experience. This year, our school’s development plan is focussing on Expressive Arts and Science. The Parent Council is working with the school on this by supporting music provision. Dorothy Ogilvy is teaching music to P1 and P2. The 1-2-3 Sing! event on 1 October was fantastic! The children had a lot of fun at the assembly and in their classrooms singing the whole morning. Our school has a happy feeling all the time anyways – but it was even more so on that morning. Thanks to the support from parents who listened to the children sing. We are hoping to assist with recorder practice as the call for helpers is made in this update. There are some other exciting things happening on the music front in the New Year but we will leave the Head Teacher to tell you about this. In the second or third term the Parent Council along with the school’s teaching team will be organising a programme of science activities. If there are any keen science enthusiasts who would like to help get in touch. Ann Archer’s involvement as a parent in teaching art to the children supports CfE and is very much appreciated. If there are any other parents who want to get involved in some way please get in touch. We know there are lots! By spreading the news of what we do, you never know what other links we might form and what other great things we can achieve. We would like to thank each of you for all that you do. We would like to support the recorder lessons that are being taught in P4 to P7 and we’d like your help. Could you spare an hour each month to help small groups of children with recorder practice? You don’t need to be a good player, just be available to help a group organise their practice time and progress. Our music specialist, Mrs Peebles, is happy to give tips and advice to get us started. Visit the blog for info on how you can help out: http://ow.ly/337V1. Thanks to new technologies like email and the web, it’s now easier than ever to be kept informed about what’s happening. Explore the Blog: You can use the School blog, an online journal where children and teachers can tell you what classes are doing and you can leave comments too. You’ll also find information from the PC and PTA. Add your email: You can add your email address or your instant message ID on the blog home page to receive automatic updates whenever something new is posted to the school’s blog. You can also choose to sign up to the school blog’s RSS feed. Visit the School Calendar: Keep on top of all the key school dates and events that crop up during term time. Save this calendar information to your own PC or phone – there are lots of tips about how to do this on the blog. http://bit.ly/PPSDATES.